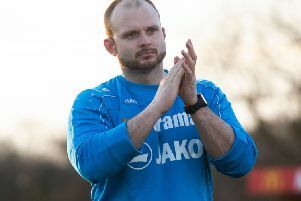 Hemel Hempstead Town will need to dust themselves off and regroup after today’s 4-3 loss at Margate when they face Whitehawk in a winner-takes-all playoff showdown at Vauxhall Road next weekend. Hemel went into today’s game knowing that, if other results went their way, a win could be enough to secure a place in the playoffs. But they never recovered from a nightmare start, and Margate were good value for the win. Elsewhere, Whitehawk’s 1-0 victory over Maidstone means that they close to within a point of the fifth placed Tudors, with a game in hand against Truro City on Tuesday night. Should they win or draw that game, they will leapfrog Hemel in the table, meaning only a win would be good enough for the Tudors to take the fourth and final playoff place. A defeat for Whitehawk on Tuesday would mean a point would suffice for Hemel on Saturday. The pressure perhaps told for the Hemel this afternoon, while their ongoing injury problems certainly didn’t help their case as they were second best from the off. With only a few seconds on the clock, Margate were awarded a free-kick wide on the left, and David Hunt’s curled delivery deceived Hemel keeper Jamie Butler and sailed into the far top corner of the net. Following their set-back, the Tudors created the next chance of the game as Harry Hickford controlled the ball well on the edge of the area and forced a fine diving save from Margate keeper Chris Lewington. Despite going into the game on the back of a run of 10 consecutive league defeats, Margate continued to pose a threat up front in the early stages and would have doubled their lead had it not been for an athletic fingertip save from Butler from Matthew Johnson’s dipping strike. Hemel were struggling to find any fluency and things went from bad to worse in the 25th minute as Margate doubled their lead. A cross was flicked to Johnson at the far post, and the big striker made no mistake in slamming the ball past Butler from close range. Hemel were forced into a change after 32 minutes as Morgan Ferrier limped off to be replaced by Daniel Pappoe, and three minutes later the Tudors had a lifeline. Harry Hickford did well to lay the ball back to Graeme Montgomery, and the winger fired home from the edge of the area into the top corner of the net. The respite was short-lived, however, as Margate restored their two-goal lead five minutes before half-time when Johnson raced to the byeline and cut the ball back for Danny Green to fire the hosts into a 3-1 lead. Hemel could have reduced the arrears shortly before half-time, but Pappoe headed Ricky Wellard’s cross wide of the far post from six yards out when left unmarked by the Margate defence. The Tudors needed something special in the second half, but they fell further behind eight minutes after the interval as Luke Moore broke the offside trap and rounded Burtler before coolly slotting home for 4-1. It should have been five for Margate when Green somehow volleyed wide from four yards out with the goal gaping, but Hemel gave themselves hope in the 67th minute when Kyle Connolly tucked the ball home following a scramble in the box. And the Tudors were right back in it in the 82nd minute as the ball fell to Montomery on the edge of the box, allowing the winger to lash home on the half-volley to give the visitors renewed hope of launching an incredible comeback. Hemel pressed forward in the closing stages and had a big penalty appeal in the 89th minute when Connolly’s strike appeared to hit a Margate arm, but the referee waved away the visitors’ appeals as the hosts held on for the three points. Margate: 1 Chris Lewington, 2 David Hunt, 3 Nathan Green, 4 Kane Wills, 5 Charlie Wassmer, 6 Glenn Wilson, 7 Lewis Taylor, 8 Luke Moore, 9 Matthew Johnson, 10 Christian Jolley, 11 Danny Green. Subs not used: 12 Dion Sembie-Ferris, 14 Corie Andrews, 15 Jake Goodman, 16 Seb Rowland, 17 Mitchell Laing. Hemel Hempstead Town: 1 Jamie Butler, 2 Ben Herd, 3 Kyle Connolly, 4 Harry Hickford, (14 Matt Spring), 5 Mat Mitchel-King, 6 Adam Bailey-Dennis, 7 Ricky Wellard, 8 Michael Richens, 9 Ibra Sekajja, 10 Morgan Ferrier (12 Daniel Pappoe, 32 mins), 11 Graeme Montgomery. Subs not used: 15 Colm Parrott, 16 Joseph Findlay-Bada, 17 Cameron Brooks.